Non-traumatic myositis ossificans is a deceptive tumor which requires precarious work up for diagnosis and apt treatment at complete maturation of tumor. Case Report | Volume 5 | Issue 3 | JOCR July-Sep 2015 | Page 18-21 | Andrew Young, Adam Mirarchi. DOI: 10.13107/jocr.2250-0685.297. 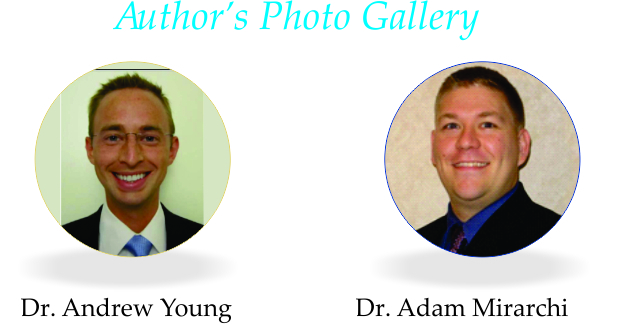 Authors: Andrew Young, Adam Mirarchi. Dr. Adam Mirarchi, Department of Orthopedics and Rehabilitation, Oregon Health & Science University, 3181 Sw Sam Jackson Pk Rd, Mail code: OP31, Portland, OR 97239, USA. Introduction: This report describes two cases of long bone non-union associated with the use of recombinant human bone morphogenetic protein-2 (rhBMP-2) and is the first of its kind. The first case describes a 25-year-old male who sustained a left diaphyseal femoral shaft fracture initially treated with operative fixation using an intramedullary nail, which subsequently loosened distally and was treated with exchange nailing and rhBMP-2 application. This patient developed acute local soft tissue inflammation post-operatively. The second case describes a 61-year-old female who sustained a right diaphyseal humeral shaft fracture that was initially treated with intramedullary nail fixation with subsequent distal interlock screw loosening. She underwent nail removal, and compression plating with rhBMP-2 placement, and postoperatively developed severe acute local tissue swelling centered over the rhBMP-2 sponge. Surgeons should be aware that rhBMP-2 may cause local acute tissue swelling and recombinant bone morphogenic proteins such as rhBMP-2 may have a role in the management for atrophic fracture non-unions. The authors recommend careful consideration prior to rhBMP-2 use in long bone non-unions. 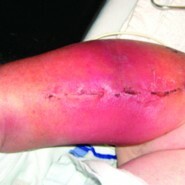 Keywords: Recombinant human bone morphogenetic protein-2, post-operative complications, swelling. In order to combat delayed unions or non-unions, there has been a great interest in the development of innovative osteoinductive biologic materials to enhance bone regeneration. Currently, only recombinant human bone morphogenetic protein-2 (rhBMP-2) (Infuse; Medtronic Sofamor Danek, Memphis, TN) and BMP-7 (OP-1 Implant; Stryker Biotech, Hopkinton, MA) have been approved by the US Food and Drug Administration for clinical use. Several clinical studies have demonstrated the positive effect of the use of BMPs on the outcome of fractures and non-unions [1-4]. Other studies have also demonstrated the efficacy of BMPs in the management of upper and lower extremity non-unions [5,6]. However, there are emerging reports of adverse events with the use of BMPs in clinical practice. Smucker et al. reported significant anterior neck swelling with several patients requiring reintubation secondary to airway compromise with rhBMP-2 use in anterior cervical spine procedures . Shields et al. reported clinically significant post-operative neck hematoma in 15/151 patients, eight of whom required surgical evacuation . In additional, several recent articles reported complications from use in the lumbar spine [9,10]. Muchow et al. reported a case of suspected rhBMP-2 induced lumbar radiculopathy secondary to acute inflammatory response . Furthermore, non-unions after BMP use have been reported recently . In a series of 30 patients, Mannion et al. reported that one patient developed non-union after lumbar interbody fusion . In light of these emerging reports, there has been discussion in the spine literature regarding the validity of the low complication rates reported in early rhBMP-2 studies, including two commentaries and two editorials in the Spine Journal [12-15]. Carragee et al. recently reviewed initial rhBMP-2 studies and concluded that the actual risk of adverse events associated with rhBMP-2 is 10-50 times higher than original estimates published in peer reviewed journals . There are no prior reports of similar adverse events associated with the use of rhBMP-2 in adult long bone fracture management. However, Ritting et al. reported one instance of severe post-operative swelling following the use of rhBMP-2 in a pediatric patient with a distal radius and ulnar fracture . His patient presented 6 weeks post-operatively with severe forearm swelling and partial wound dehiscence. We present a report of two cases of severe acute inflammation secondary to the use of rhBMP-2 in fracture non-union repair procedures. A 25-year-old male sustained a left diaphyseal femoral shaft fracture (Winquist 4, OTA classification 32-C3)  in a roll-over motor vehicle accident (Fig. 1). He underwent stabilization of his femur fracture on post-injury day 1 with a statically locked 13 mm × 400 mm retrograde intramedullary nail. Radiographs 2 months later demonstrated acceptable alignment with limited callus formation at the fracture site. Five months follow-up radiographs demonstrated hardware loosening and backing out of the distal interlocking screws along with halo lucency in the distal femoral metaphysis adjacent to the intramedullary nail (Fig. 2). There was minimal bridging callus at the fracture site, and the patient reported thigh pain localized to the surgical site. There was concern for development of an atrophic non-union at the fracture site. Erythrocyte sedimentation rate and C-reactive protein were elevated. The patient underwent reamed exchange retrograde femoral nailing of his non-union fracture along with open debridement of the fracture site and placement of a large-size rhBMP-2 sponge with cancellous bone allograft. Intraoperative tissue cultures obtained during the non-union repair procedure failed to grow any organisms. On post-operative day 1 the patient complained of increasing pressure and pain in the left thigh. He returned to the operating room urgently for hematoma evacuation and the skin overlying the operative area was noted to be edematous and thickened. The use of the rhBMP-2 was questioned as a possible cause. His symptoms were significantly reduced postoperatively, and he was discharged to home, however, he presented emergently 5 days later with increased thigh pain and pressure. Repeat operative debridement of all non-viable tissue (primarily vastus lateralis muscle) and extensive lateral thigh fasciotomy were performed due to elevated intraoperative compartmental pressure measurements (anterior thigh systolic compartment pressures of 95 mmHg, diastolic pressures were 70 mmHg on average). The large rhBMP-2 sponge was removed. Vastus lateralis muscle biopsy specimens were obtained revealing ischemic changes with granulation tissue. Skin closure was not performed, and a negative pressure wound V.A.C. (KCI Inc.; San Antonio, TZ) dressing was applied to the fasciotomy site. There was no evidence of acute post-operative infection, and all intraoperative cultures were negative. The patient ultimately required a split thickness skin graft at the fasciotomy site for definitive soft tissue coverage. He was placed on a 6 weeks course indomethacin (25 mg by mouth 3 times daily) for prophylaxis against heterotopic ossification. Seven months after the non-union repair procedure, radiographs revealed persistent fracture non-union with exuberant ectopic bone in the thigh musculature (Fig. 3). At that time, his exam was significant for minimal pain without obvious deformity. Despite multiple attempts to contact him the patient has been lost to follow-up. A 61-year-old female sustained a right diaphyseal humeral shaft fracture that was initially treated with intramedullary nail fixation using a deltopectoral splitting approach. Eight months after her index surgery she complained of instability and pain at the fracture site. Radiographs revealed an atrophic-appearing non-union (Fig. 4). She underwent intramedullary nail removal, debridement of the fracture site and compression plating of her fracture non-union using a combined deltopectoral and anterolateral approach. Intraoperative fracture biopsy specimens revealed no evidence of inflammation with <1 white blood cell per high-powered field. A small rhBMP-2 sponge was placed alongside the fracture site. She was seen in the outpatient clinic on post-operative day 7 and noted to have a large erythematous and edematous region centered over the incision. She was started on a short course of oral antibiotics. Radiographs at her initial follow-up did not show any loss of fixation or hardware failure. She was seen in the outpatient clinic on post-operative day 9 with continued complaints of significant swelling and pain in her arm. There was now gross motion noted at her fracture site and radiographs demonstrated loss of fixation with pullout of the distal screws (Fig. 5). The swelling and erythema appeared to be out of proportion to that which would be expected with loss of fixation (Fig. 6). The patient returned to the operating room for revision fixation and debridement for suspected deep post-operative surgical site infection. Intraoperative findings were not consistent with infection. Considerable woody edema was found within the biceps and brachioradialis muscle bellies, centered over the BMP sponge. She underwent revision internal fixation and removal of the rhBMP-2 sponge (Fig. 7). One week postoperatively, her swelling was significantly decreased, and radiographs demonstrated acceptable alignment of her fracture site without evidence of hardware failure or loosening. Three weeks post-operatively, her arm swelling had completely resolved and radiographs demonstrated stable fixation with progressive healing at her non-union site. Final follow-up at 1 year revealed complete union at the fracture site and a normal soft tissue envelope. Our case series describes two instances of long bone non-unions treated with rhBMP-2 associated with severe local soft tissue inflammation. There may be a dose-response relationship with the concentration of rhBMP-2 utilized and the severity of associated acute inflammatory response. Zara et al. in a rat animal model reported that high dose rhBMP-2 induced the abnormal bone formation and local soft tissue inflammation . The swelling experienced by the patient in Case 2 may have been caused by both the rhBMP-2 sponge and inadequate fracture fixation; although post-operative day 7 radiographs showed no loss of fixation, yet severe erythema and edema were present at the operative site. In Additional, hematoma formation is known to promote soft tissue swelling post-operatively, and may have contributed in both of these cases. However, large collection of blood was not noted in the wounds during any of the subsequent operations. Another potential contributing factor to the severe swelling may be anatomic location. All reported adverse swelling events in the literature have occurred with the use of rhBMP-2 in spinal fusion procedures, particularly in the cervical spine. However, no reports exist with severe swelling occurring elsewhere in the body except in Ritting’s et al. article . The authors speculate that the difference in the soft tissue envelope may be a contributing factor. The tissue envelope surrounding the femur, humerus, cervical spine, and the forearm is more substantial than the tibia, and this may stimulate a greater and more severe inflammatory response. Recombinant bone morphogenic proteins such as rhBMP-2 may have a role in the management for atrophic fracture non-unions; however, the dose-effect relationship has not been clearly defined. While it is recommended rhBMP-2 should be used in a well-vascularized area , this may paradoxically promote local severe soft tissue inflammation. More rhBMP-2 is not necessarily better. Surgeons must be aware of potential complications of soft tissue swelling associated with the use of rhBMP-2 in the upper and lower limbs, and the authors recommend careful consideration prior to use in long bone non-unions. 1. Govender S, Csimma C, Genant HK, Valentin-Opran A, Amit Y, Arbel R, et al. Recombinant human bone morphogenetic protein-2 for treatment of open tibial fractures: A prospective, controlled, randomized study of four hundred and fifty patients. J Bone Joint Surg Am 2002;84-A(12):2123-2134. 2. Burkus JK, Gornet MF, Schuler TC, Kleeman TJ, Zdeblick TA. Six-year outcomes of anterior lumbar interbody arthrodesis with use of interbody fusion cages and recombinant human bone morphogenetic protein-2. J Bone Joint Surg Am 2009;91(5):1181-1189. 3. Baskin DS, Ryan P, Sonntag V, Westmark R, Widmayer MA. A prospective, randomized, controlled cervical fusion study using recombinant human bone morphogenetic protein-2 with the CORNERSTONE-SR allograft ring and the ATLANTIS anterior cervical plate. Spine (Phila Pa 1976) 2003;28(12):1219-1224. 4. Jones AL, Bucholz RW, Bosse MJ, Mirza SK, Lyon TR, Webb LX, et al. Recombinant human BMP-2 and allograft compared with autogenous bone graft for reconstruction of diaphyseal tibial fractures with cortical defects. A randomized, controlled trial. J Bone Joint Surg Am 2006;88(7):143114-143141. 5. Friedlaender GE, Perry CR, Cole JD, Cook SD, Cierny G, Muschler GF, et al. Osteogenic protein-1 (bone morphogenetic protein-7) in the treatment of tibial nonunions. J Bone Joint Surg Am 2001;83-A Suppl 1:S151-S158. 6. Dimitriou R, Dahabreh Z, Katsoulis E, Matthews SJ, Branfoot T, Giannoudis PV. Application of recombinant BMP-7 on persistent upper and lower limb non-unions. Injury 2005;36 Suppl 4:S51-S59. 7. Smucker JD, Rhee JM, Singh K, Yoon ST, Heller JG. Increased swelling complications associated with off-label usage of rhBMP-2 in the anterior cervical spine. Spine (Phila Pa 1976) 2006;31(24):2813-2819. 8. Shields LB, Raque GH, Glassman SD, Campbell M, Vitaz T, Harpring J, et al. Adverse effects associated with high-dose recombinant human bone morphogenetic protein-2 use in anterior cervical spine fusion. Spine (Phila Pa 1976) 2006;31(5):542-547. 9. Chen NF, Smith ZA, Stiner E, Armin S, Sheikh H, Khoo LT. Symptomatic ectopic bone formation after off-label use of recombinant human bone morphogenetic protein-2 in transforaminal lumbar interbody fusion. J Neurosurg Spine 2010;12(1):40-46. 10. Muchow RD, Hsu WK, Anderson PA. Histopathologic inflammatory response induced by recombinant bone morphogenetic protein-2 causing radiculopathy after transforaminal lumbar interbody fusion. Spine J 2010;10(9):e1-6. 11. Mannion RJ, Nowitzke AM, Wood MJ. Promoting fusion in minimally invasive lumbar interbody stabilization with low-dose bone morphogenic protein-2 – But what is the cost? Spine J 2011;11(6):527-533. 12. Carragee EJ, Ghanayem AJ, Weiner BK, Rothman DJ, Bono CM. A challenge to integrity in spine publications: Years of living dangerously with the promotion of bone growth factors. Spine J 2011;11(6):463-468. 13. Smoljanovic T, Bojanic I. An evolving perception of the risk of rhBMP-2 use for anterior spinal interbody fusions. Spine J 2011;11(6):520-521. 14. Branch CL Jr. Physican-directed (off-label) use of recombinant bone morphogenic protein-2: Let us do it well! Spine J 2011;11(6):469-470. 15. Mirza SK. Folly of FDA-approval studies for bone morphogenetic protein. Spine J 2011;11(6):495-499. 16. Carragee EJ, Hurwitz EL, Weiner BK. A critical review of recombinant human bone morphogenetic protein-2 trials in spinal surgery: Emerging safety concerns and lessons learned. Spine J 2011;11(11):471-491. 17. Ritting AW, Weber EW, Lee MC. Exaggerated inflammatory response and bony resorption from BMP-2 use in a pediatric forearm nonunion. J Hand Surg Am 2012;37(2):316-321. 18. Marsh JL, Slongo TF, Agel J, Broderick JS, Creevey W, DeCoster TA, et al. Fracture and dislocation classification compendium – 2007: Orthopaedic Trauma Association classification, database and outcomes committee. J Orthop Trauma 2007;21(10 Suppl):S1-S133. 19. Zara JN, Siu RK, Zhang X, Shen J, Ngo R, Lee M, et al. High doses of bone morphogenetic protein 2 induce structurally abnormal bone and inflammation in vivo. Tissue Eng Part A 2011;17(9-10):1389-1399. 20. Perri B, Cooper M, Lauryssen C, Anand N. Adverse swelling associated with use of rh-BMP-2 in anterior cervical discectomy and fusion: A case study. Spine J 2007;7(2):235-239.